Proud to support Billingham Foodbank. 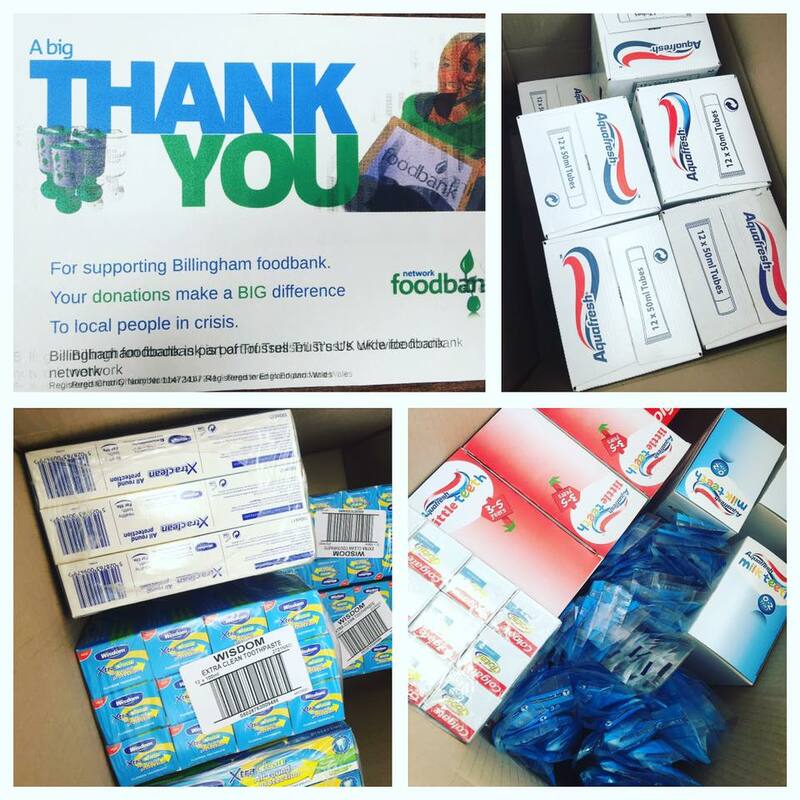 Through the ongoing sale of our brace care packs we are proud to support Billingham Foodbank. For each pack sold we are able to donate a tube of toothpaste and a toothbrush to the foodbank, a service which provides emergency food and support to local people in crisis. Every 3 months we visit the Foodbank (which is just around the corner from our practice) to deliver the toothbrushes and toothpastes which are then used in packs providing 3 days emergency food and toiletries to people in crisis. 13 million people live below the poverty line in the UK. Along with lots of other foodbanks across the country, the Billingham Foodbank provides emergency food, clothing and toiletries to support local people in crisis. We would like to say a big thank you to our patients for helping us to be able to do this. To find out more about the Billingham Foodbank you can visit their website or Facebook page. NHS Friends and Family Test - March results are in! NHS Friends and Family Test - February results are in! NHS Friends and Family Test - January results are in! NHS Friends and Family Test - December results are in! NHS Friends and Family Test - November results are in! NHS Friends and Family Test - October results are in! NHS Friends and Family Test - September results are in! Corrina talks about her smile transformation with us! NHS Friends and Family Test - August results are in! Are you an NHS orthodontic patient at Queensway? We would love to hear about your experience! NHS Friends and Family Test - July results are in! NHS Friends and Family Test - June results are in! Caroline had a smile makeover with Queensway Orthodontics! Charlotte transformed her smile with Queensway! Queensway nominated for the North East's Best Place to Work Awards - run by The Journal! Anthony straightened his teeth with Queensway Orthodontics! Our team took part in a well-being programme! Guy and Michelle join the panel for the Invisalign Forum 2018! Dr Guy Deeming and Dr Jonathan Chapple head to Bourne House! NHS Friends and Family Test - May results are in! NHS Friends and Family Test - April results are in! December patient satisfaction feedback: What do our patients say about us? November patient satisfaction feedback: What do our patients say about us? October patient satisfaction feedback: What do our patients say about us? Start tracking your Invisalign progress today! Queensway Orthodontics takes on Luton Hoo! Guisborough Rugby club take over Queensway Orthodontics! September patient satisfaction feedback: What do our patients say about us? The team had a busy but fun packed few days at the British Orthodontic Society's annual conference. August patient satisfaction feedback: What do our patients say about us? July patient satisfaction feedback: What do our patients say? June patient satisfaction feedback: What do our patients say? Where were our team in June? Queensway Orthodontics hit the big screen! Watch our cinema advert here! #Queenswaybraceselfie - May winner revealed! May patient satisfaction feedback: What do our patients say? Queensway Dental are looking for a new team member! We are looking for a dental nurse to join our team! Time to celebrate for dental nurses Vicki and Chantelle! April patient satisfaction feedback: What do our patients say? March patient satisfaction feedback: What do our patients say? February patient satisfaction feedback: What do our patients say? Are you an NHS orthodontic patient at Queensway Orthodontics? We would love to hear about your experience! January patient satisfaction feedback: What do our patients say? November patient satisfaction feedback: What do our patients say? October patient satisfaction feedback: What do our patients say? A busy week in London for the QO Team! September patient satisfaction feedback: What do our patients say? August patient satisfaction feedback: What do our patients say? June 2015 patient satisfaction feedback: What do our patients say? Injured teeth: What to do if a tooth is knocked out! Are you an NHS patient at Queensway Orthodontics and aged between 9 and 18? December patient satisfaction feedback: What do our patients say? What to expect during brace treatment? The active phase! Damon braces - the best thing in orthodontics? Patient satisfaction feedback: What do our patients say? Successful brace treatment? ... It's in the brushing!